BRC: “With the advent of the new Adventure ICE has made some improvements with a bombproof rear rack, improved componentry, new seat, and most of all front suspension. The Adventure is the updated model of the older Trice “T” that I used on two long distance solo self supported trips. One trip was 800 miles around the state of Florida and the other was from Florida up the east coast to Pittsburg. The last 400 miles were on dirt trails (the C&O canal towpath to the GAP rail trail) and I found the T with rear suspension to be the ideal trike for loaded touring. From my experience having owned both a Catrike road and the ICE “T”:, the comfort of having suspension makes riding day after day as one does long distance touring a much less fatiguing experience in the long run, as opposed to getting beaten up riding an un-suspended aluminum frame trike. Riding back roads very often means rough chip and seal surfaces and if you read any tour journals of folks who have ridden coast to coast on an un-suspended trike like the Catrike, they will very often write about the harsh roads they encounter. This can really take the fun out of that day’s tour. I recommend that you consider going with the Sturmey/Archer drum brakes for an Adventure as the drum brake requires virtually no maintenance and is immune to mud, sand, water, and icing up. All of these attributes are a plus for someone touring and possibly riding dirt roads. The other attribute that the ICE trikes have which makes them the premier choice for the touring triker is they have the only trikes on which you can mount a handlebar bag next to the seat. I found this feature to be invaluable to me on my trike tours for my wallet, phone, sunscreen camera, and most importantly, my route map. 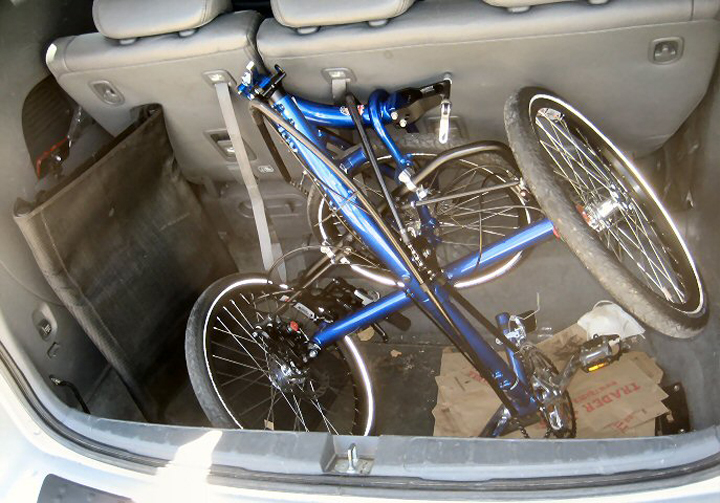 The folding feature is very important to the convenience of owning a trike, especially when on a long tour. Unless you start and finish your adventure from home, you must consider the logistics of transporting your trike to the beginning and back home at the end of your trip. 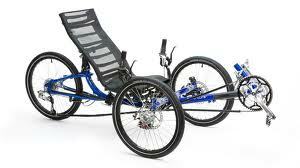 With a non-folding trike you really limit your transport options to a pretty big vehicle. The Adventure sits up higher than the Sprint or the Vortex and so is slightly less aerodynamic riding into a headwind, but the higher seat makes it easier to get in and out of and provides a slightly more elevated view over tall grass and guardrails at the roadside that may obstruct the scenery. We ride trikes mainly because they are so very comfortable and full suspension extends that range of comfort even further.